on October 17, 2017, 6:07 p.m.
Are you gentle like a Gemini or stubborn like a Scorpio? And does this make you compatible or incompatible with that lovely-looking Libra sitting next to you? More to the point, do you believe in horoscopes? New YouGov research suggests that star signs are back in vogue, with younger generations more likely to be auspicious than their elders. Overall, just over four in ten (43%) of those surveyed within APAC take horoscopes either very or somewhat seriously but this rises to 48% for those between 16-29 and falls to 31% for those over 45. Residents of Vietnam, China and Thailand take horoscopes the most seriously in the region, where 75%, 68% and 52%, respectively, take horoscopes seriously. By contrast, Malaysians, Singaporeans and Australians are the least likely to take horoscopes seriously, where just 23%, 28% and 29%, respectively, take horoscopes seriously. Six in ten believe someone’s star sign can accurately predict their character and personality traits and 55% have checked to see whether their star sign is compatible with someone else’s. This rises to 62% among women and falls to 49% among men. A third (33%) of those polled have actually changed their behaviour based on something they’ve read in their horoscope. A similar proportion of the population (35%) say their feelings towards someone they were interested in romantically would change either “a lot” or “a moderate amount” if they found out their star signs were very compatible. Interestingly, the number of respondents who say their feelings would change “a lot” doubles if they were to find out their star signs were considered to be “very compatible” as opposed to “very incompatible”. 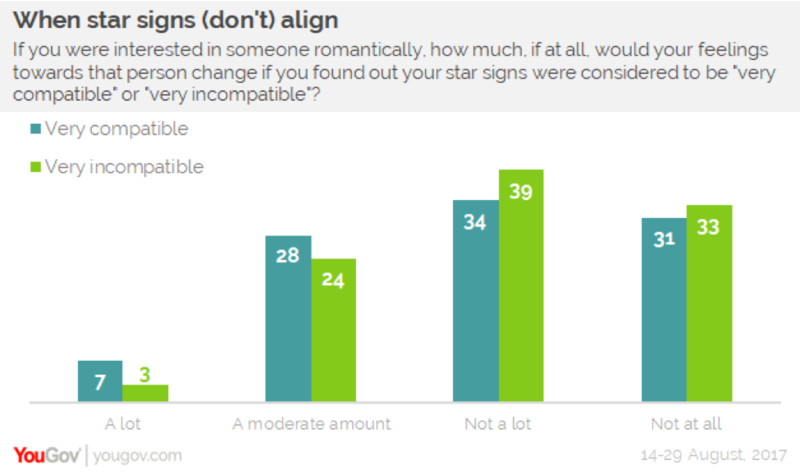 Similarly, respondents say their feelings are less likely to change if their star signs were found to be “very incompatible”. Horoscopes are also big business, with three in ten (30%) saying that they have previously bought horoscope related products. The most popular purchases are accessories, bought by half (51%) of all those who have previously purchased horoscope related products. Other popular products include gem stones that signify either star sign or birth month (bought by 46%), clothing (31%) and stationery (29%).